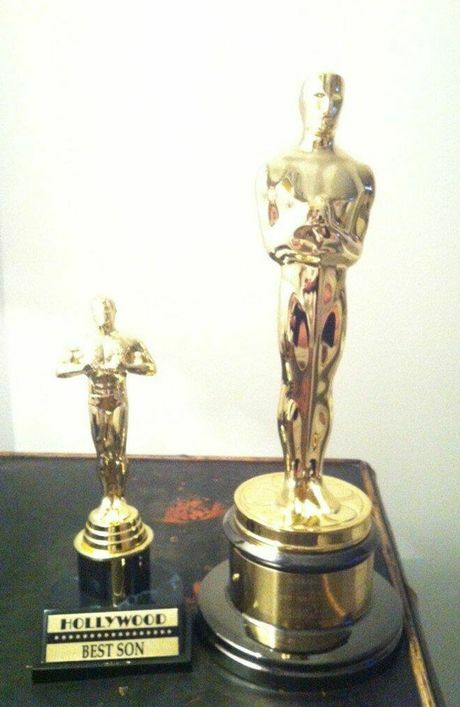 ADELE has given her baby a Best Son Oscar. The 'Skyfall' singer - who picked up the Best Original Song prize at the Academy Awards last month - decided to celebrate her big win by presenting her five-month old tot Angelo with his very own mock statue from a souvenir shop. She posted a picture of her coveted award on Twitter alongside the joke gong, adding the caption: "..and we're home! What an epic trip. Thanks for having us Hollywood!" The baby boy - who Adele has with her boyfriend Simon Konecki - travelled to Los Angeles with her for the star-studded show. The 24-year-old hitmaker made her first live performance since giving birth last October during the ceremony and welled up as she addressed the crowd in an emotional speech. Dressed in a floor-length, embellished black Jenny Packham gown, Adele also thanked her charity worker beau Simon, who was her date for the evening, and gave her a quick kiss after her name was announced. She added: "And my man, I love you baby."